The next series of blogs is a brief discussion of different types of medications used for pain. Non-steroidal anti-inflammatory drugs (NSAIDs) are generally one of the first line of medications used in the initial treatment of pain. They are exactly what their name means – they are not steroid medications (like cortisone or prednisone) and they reduce inflammation which is the body’s response to any damage from any cause. When inflammation occurs there is pain along with redness, swelling and heat, which are collectively known as the cardinal signs of inflammation. Examples of NSAIDs are ibuprofen (Advil/Motrin), naproxen (Naprosyn), meloxicam (Mobic), and diclofenac (Voltaren). Aspirin is similar to the NSAIDs in almost every way but curiously it helps prevent heart attacks whereas NSAIDs may cause them (see below). Although NSAIDs have a number of side effects, the two most common are stomach irritation and an increased tendency to bleed. That’s why you are advised to eat when taking NSAIDs and why you have to stop taking NSAIDS before any type of intervention that may cause bleeding (such as injections or surgery). In order to decrease the side effect of stomach irritation, many have switched to a topical NSAID, most commonly diclofenac which is offered as a patch (Flector-patch) or gel (such as diclofenac or Voltaren gel). 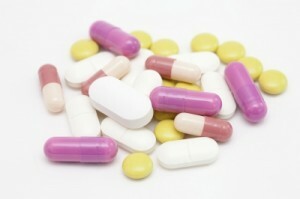 Other potentially serious side effects include kidney failure – if your kidneys are not working properly the NSAID can cause them to stop functioning, asthmatic episodes if you are prone to having asthma, and heart attacks if you have cardiovascular disease (heart disease, high blood pressure, history of stroke).